Audiobus compatible apps can be used with Echo Pad, to process them with the delay effects and/or capture loops and samples with Echo Pad's loopers. Echo Pad supports Audiobus Effect and Input slots. See http://audiob.us for more information. Also, be sure to check out the Echo Pad + Audiobus tutorials on YouTube. To connect Echo Pad, simply tap the Input or Effect slot in Audiobus, then choose Echo Pad. Effect Slot - As an Effect source, Echo Pad is used to process Input sources through the delay effects engine and loopers. Use Echo Pad like a hybrid somewhere between a Space Echo and a Kaoss Pad! Input Slot - As an Input source, you can run your mic, guitar or even external hardware synths through Echo Pad's effects and loopers, combined with a drum machine or synth app input source, then capture each apps output in a DAW such as Multi-track DAW.
! - Step 1 is the most important, and usually resolves any potential problems you may have with Echo Pad and/or any other Audiobus compatible apps. 1.) Launch Audiobus FIRST. This is important! 2.) Once Audiobus is open, connect Echo Pad and other apps inside the Audiobus connection panel. 3.) Make sure you have an OUTPUT app connected. Even if you are not recording into an app like Auria, Cubase, Multi-track DAW, etc. you still need to connect the "Speaker Output" app. *If you experience excessive glitches in audio, please set the buffer size to 512 samples in Audiobus. If you have followed all recommended solutions IN THE CORRECT ORDER and are still experiencing problems, please contact support. 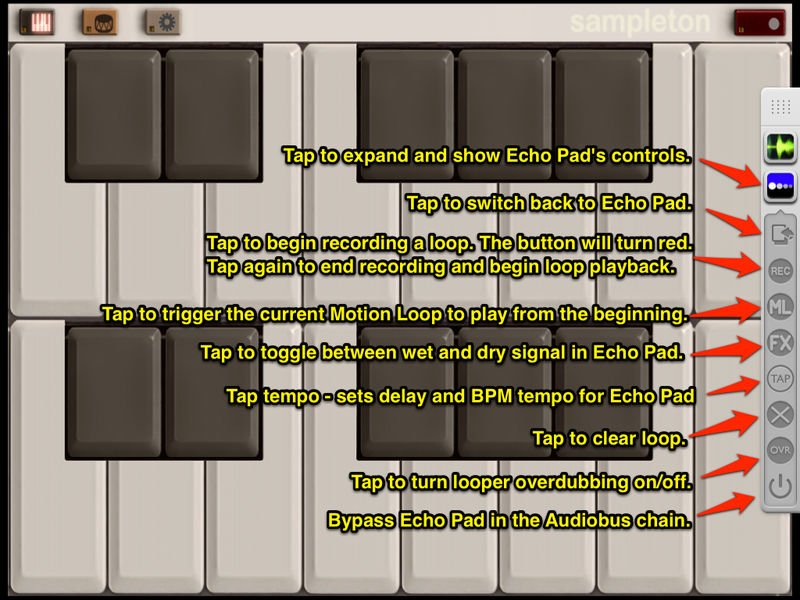 Echo Pad can be controlled remotely from other apps when connected through Audiobus. In the Audiobus side panel, Echo Pad features controls for loop recording, overdubbing and clearing the loop, triggering motion loops, tap tempo, and toggling FX on/off. Let's have a look at the controls in the side panel.